The recent influx of Chinese talent in the NBA (National Basketball Association) has caused quite a change in sports preference among asian people. Yao Ming and Yi Jianlian, no matter how awkward or big they are, have made names for themselves with the Houston Rockets and Milwaukee Bucks. Let’s not forget their long lost brother Wang Zhihi, who first played for an NBA franchise. Due to these players, Asians everywhere have newfound hope in being able to succeed in things other than Pharmacy or Programming. Try walking down to Mile Square Park one day, and it will be evident that the number of Asians has equaled or even outnumbered the amount of Hispanics or African Americans. Basketball, contrasting Manga, Anime, or Purikura, has made its way across the Atlantic and into the hearts of asian people everywhere. Nowhere is this more apparent than in China, where there are more people playing basketball (300,000,000) than the total United States population. If one takes a closer look at the “new breed” of asian, they are much taller than their predecessors. This is due partially to better nutrition and eating habits in the United States. Now try watching a lakers broadcast without seeing an Asian celebrity in the stands. 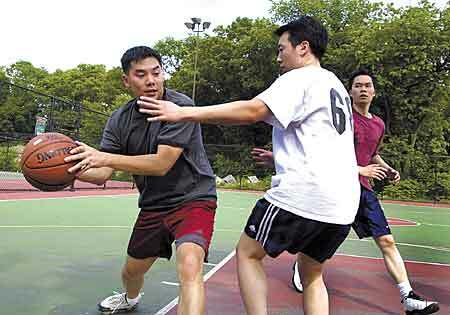 Be it Bobby Lee, or Michelle Kwan, these stars have also spurred the Asian love of basketball. However, there will always be the sedentary and more classical breed of asian. This is not a problem. Basketball is the wave of the future, however, and as more NBA talent comes from overseas, the number of asian kids wearing Kobe Bryant and T-Mac Jerseys trash-talking and throwing balls “off the heezy” will likewise rise. These Asians will grow up and teach their children the love of basketball, and they in turn will teach theirs. It’s the circle of life. 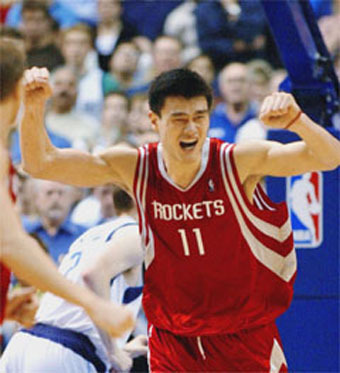 Check out Yao Ming and Yi Jianlan’s player profiles. They are shining beacons for Asians, causing this writer to believe that: ASIANS LOVE BASKETBALL.